With a passion for fitness, Albion Park resident Lisa Trujillo dived straight into the health industry after finishing school in 2011. 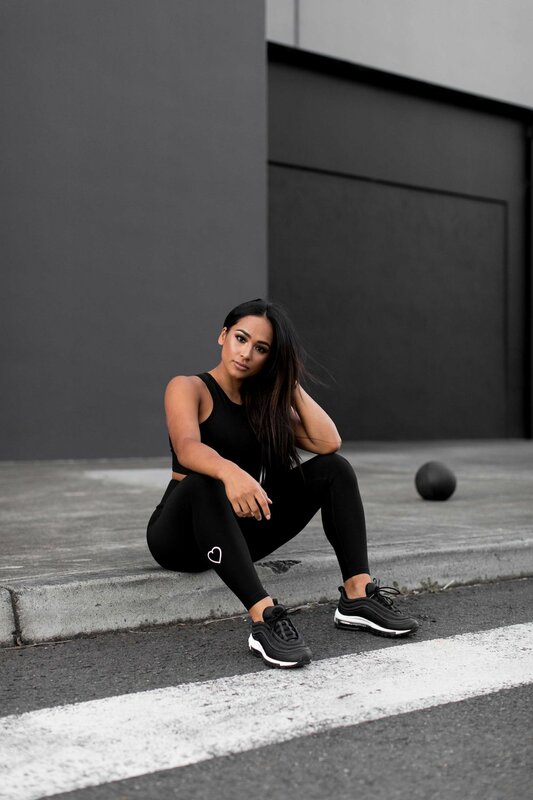 After working in local gyms for over five years, she took a chance and created her own range of exercise gear, LT Active Wear. It was a leap worth taking, because today the brand has proven such a success, that she devotes herself to it full-time. On top of her clothing line, 24-year-old Lisa also runs Booty Boot Camps almost every weekend, everywhere from Wollongong’s Crown Street Mall to gyms, parks and factory spaces up and down the coast. Having gained a massive following among women of the Illawarra, Lisa Trujillo’s blossoming brand is smashing goals! Yes! I was always inspired by different celebrities wearing funky outfits or even just the older girls I knew from school or gymnastics wearing outfits I couldn't afford. I didn’t come from a wealthy family – I was never able to spend a lot on a nice top or dress whenever I wanted but I've always been hard-working. I worked as soon as I could and that's when my real passion for activewear developed. I've always admired fit, confident and strong people. At 15 I got my first gym membership. I would work, train and spend my money on activewear! Where did the idea for creating your own activewear line stem from? My main clientele for the last four years has been women, and I started noticing that a lot of them looked uncomfortable during their workouts. I’d always dreamt of creating my own label, but never followed through because I thought, ‘Who would wear a pair of Lisa Trujillo tights?!’. I started with 50 pieces, deciding that if it didn’t sell I’d try a different design and then if that didn’t work… I’d go back to the drawing board. As much as I love designing different patterns for the ladies’ range I'm actually moving into more basic colours. You can't go wrong with a classic, simple, plain pair of tights. I will stick to designs for my kids range (LT Junior) because the vibrant prints are a massive hit for the little ones – in summer I'll release designs like florals, watermelons and flamingos! When did you decide to focus on your LT brand full-time? To begin with, it was really scary. I’d been thinking about leaving my full-time job for about five months before I actually did it. I liked the idea of working for myself and choosing when I got to work. I’ve been working on the LT brand full-time for about a year now and I’m still so happy and passionate about what I’m doing. I get up around 6-6.30AM. As soon as I'm up I drink a glass of water or warm water with lemon. Lately I've been trying to get into the habit of not checking my phone as soon as I get up, instead those hours in the morning are my self-care time to switch off from the world before my crazy busy day begins. I love to get moving in the morning, whether it’s a walk, a workout or just some simple stretches, it keeps me productive all day. The majority of my weekdays are spent at our warehouse, LT Active Wear HQ, either at my desk responding to emails, generating content, managing social media, packing orders, organising photoshoots or in meetings. What have you learnt since starting LT Active Wear? So much! My first lesson would be – if you want your business to grow, you need to put in the work. Whatever you put in, you will get back in return. I also think it’s important to listen to what others have to say, but to block out the negativity. You don’t know if something is going to work until you try. Are there any future plans for LT? I get asked a lot if I’ll ever open up a store, but I don’t think that’ll ever happen. It’s a lot easier to place an order online, pack it and send it out. My main focus right now is to grow the brand more – both LT Active Wear and my boot camps. I’d love to travel around Australia and eventually the world, running LT Boot Camps with 1000-2000 girls.